The Auditor General’s report covered 2010, 2011 and 2012; with information on instances of overspending, expenditures not having the required Cabinet approval, contracts not being tendered, duplicate payments being made and other issues pertaining to tens of millions of dollars. “It is evident that the policies, procedures and rules pertaining to capital expenditures are being violated to such an extent that it has now become the norm for which there are no consequences,” the report said. 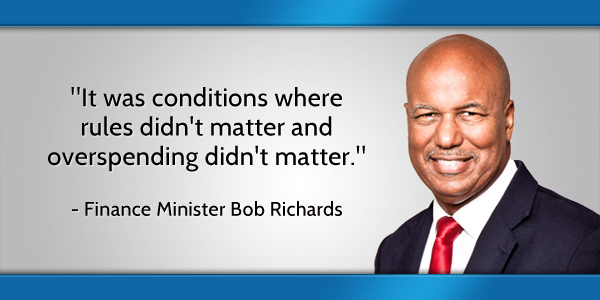 Minister Richards told Bernews, “The Auditor General’s report was not really shocking to those of us who’ve been in the Government for the last few years. Quite frankly, it wasn’t substantially different from the previous one that she brought forth, but it just didn’t indicate the really high level of deficiencies in governance that prevailed in the former Government. “It was conditions where rules didn’t matter and overspending didn’t matter. This is the sort of thing that we can’t countenance, and I’m very glad that she brought this report forward albeit it’s very late in the day. It would have been much more impactful if it would have been able to arrive a year or so earlier, because we are in 2015 now and the report is as of March, 2012. “It does give a very good report what went on in the former Government and why the spending was out of control, why the deficits were so huge, and why were in the kind of financial situation we are in today,” continued the Minister. “You can’t have that sort of situation where rules don’t matter, overspending doesn’t matter, and there are no consequences to your action. You can’t do that and expect not to have, at least, monetary consequences. That’s what you have. “The state of governance in the Civil Service as whole leaves a lot to be desired. We have been trying to come to grips with that in terms of Civil Service reform etc. “The bottom line here is that there is a fundamental lack of accountability in Government, and accountability starts at the top. Senior Civil Service basically don’t answer to anybody. We can’t have a situation like that. That situation can not continue. “We are trying to get some accountability in the senior ranks of the Civil Service. Once that happens, then they will pass that all along down the line but, as it stands right now somebody can overspend or do something else that wrong, and there’s no sanction. They just keep doing it and this is what we’ve seen. “I think that’s the most serious aspect of this. There are also many anecdotes of ridiculous kinds of mistakes going on there, but there’s so much of it I think you can’t address it all at one time. I think the overarching message is that the former Government, their level of governance was really poor. I would probably give them an “F”, if I were to grade them. The report was released earlier this month, and includes the results of audits of the Consolidated Fund for the years ended March 31, 2010, 2011 and 2012. In it, the Auditor General provided information on instances of overspending, capital development transactions not complying with Financial Instructions, expenditures not having the required prior Cabinet approval, contracts not being tendered, and duplicate payments being made. Some extracts and the full report is below. For the year ended March 31, 2012, twenty-four ministries and departments collectively overspent approximately $36 million on current expenditures without prior legislative approval. Many of the capital development transactions selected for testing during 2010 did not comply with Financial Instructions, P.F.A 2000 or P.F.A 2002. We requested supporting documentation for an estimated $35.5 million spent on capital contracts and purchases and 15% [$5.2 million] did not have supporting documentation. Of the remaining $30.3 million, many failed to comply with the applicable purchasing and approval standards. The majority lacked the required prior approval of Cabinet, did not have agreements or contracts and/or did not follow the basic tendering procedure. 2 – The original contract sum for the Central Laboratory Building project was approximately $46,000. 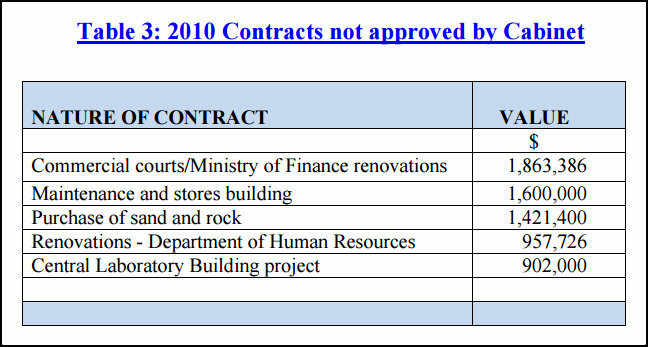 In 2010, the contract did not receive prior Cabinet approval. Additionally, W&E noted that the services were not tendered but were negotiated with the knowledge of the PS. Additional services of $856,000 resulted in a final contract amount of $902,000. There were numerous cases [69% or $43 million of expenditures greater than $1 million in 2011] which violated the requirement for prior Cabinet approval. 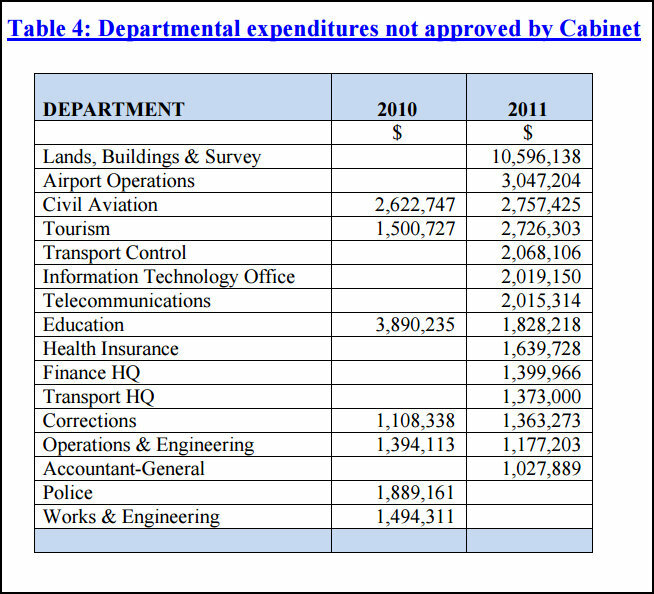 In both 2010 and 2011, expenditures tested for the following departments did not have prior Cabinet approval. It is evident that the policies, procedures and rules pertaining to capital expenditures are being violated to such an extent that it has now become the norm for which there are no consequences. Compliance with the required procedures for the procurement of goods and services reduces the risk of non-performance, fraud and misappropriation. Persons with signing authority should be held accountable for breaches of compliance of the relevant Financial Instructions and rules. Tendering is required for any contract where the value of goods and services exceeds $50,000. Financial Instruction 8.3.1 requires Ministries and Department to obtain quotations from suppliers of goods and services. The minimum number of quotations to be obtained and the rigour of the evaluation and awarding process depend on the size of the purchase or contract as well as the potential cost/benefit of administering the tendering process. Terrific, nothing illegal, no charges, no accountability and no changes made to ensure it doesn’t continue. Er, actually a big change was made to ensure it doesn’t continue. We voted for a different government. That’s what you’d love to think. I think the simple point being made is that we need rules in place to MAKE sure it doesn’t happen again rather than relying on moral politicians (now there’s an oxymoron!!) and HOPE that it doesn’t. Who could argue? And many would be so relieved if it ended there. But many more would be infuriated. Follow the money….somebody follow the money…. $53 million doesn’t just evaporate. We know it’s gone and where the trail starts. 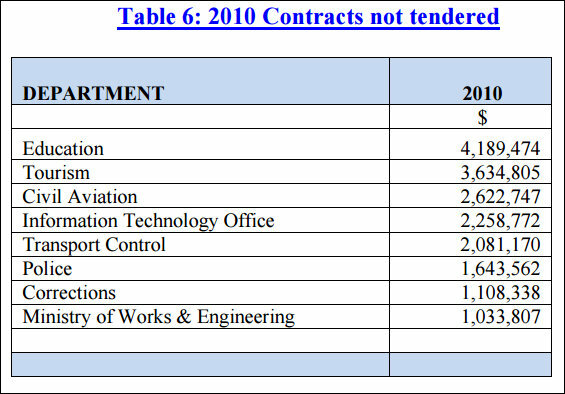 This needs looking into, 2010 they worked to create a central lab expecting to be around $46,000, went ahead without cabinet approval, then it cost a further $856,000… that is a cost overrun of over 1,860%. Additionally, I don’t think government owns, or owned it at the time, that building, making they either rent or brought it… from who? Not good enough. Follow the money. Bob, with all due respect, you are preaching to the choir. Everyone knows what happened during the PLP’s time in gov’t. That’s why we voted them out! What we want to hear is how we are going to get the money back, and who is going to be held accountable. I hope somebody in the OBA cabinet keeps an eye on public opinion on these forums. It is one thing when somebody has an opinion that nobody eles or few others agree with. Something worth paying attention to when there are 20,30, plus votes of approval to an opinion. Simple solution. Any dept that overspends beyond their budget, gets their budget for the next year cut by 10%. Failure to meet that budget results in termination. Finding of irregularities results in termination. That is just too darn simple for a government. Governments are set up to be complicated on purpose. So…… here we have the oba, always putting the blame elsewhere. Would they have their OWN heads roll for this!! I sincerely doubt it!! Always in the right and everyone else in the wrong.I haven’t seen this group of individuals own up to anything that involves a blunder!! That would be like the US taking responsibility for Pearl Harbor. You just don’t get it at all. Seriously! This is out there in plain sight, black and white with the numbers not lying. Yet you want to deflect and nitpick? Name one situation the OBA has been involved in that comes even close to this level of negligence!? ONE? That is an incredible amount of money to waste in a year! A recession year! And you wonder why the combined opposition are crying every time there is a concerted effort to reduce government spending. @ Bermyman; my friend you are wasting your time. There are people in our little Island that just don’t get it EVEN when it’s right in front of their nose in black and white. And even more scary, is the ones that DO GET IT, but are in denial and REFUSE to accept FACT. You are part of the problem aren’t you. Haha did you even read what you wrote? Well, no, they wouldn’t have their own heads roll for this because they aren’t responsible for the 3 consecutive qualified audits showing $53 million in misappropriated public money. Unfortunately, it isn’t looking like they intend to see that consequences are brought to those who were responsible. As for owning up to blunders. Blunders are what the OBA have had a few of. This situation along with all the others that pissed away our money under the PLP are not “blunders” and that’s why you will never see anyone own it or apologise for it. A lot of those same people are now running the Cabinet Office…so now they are being even more for their blunders. 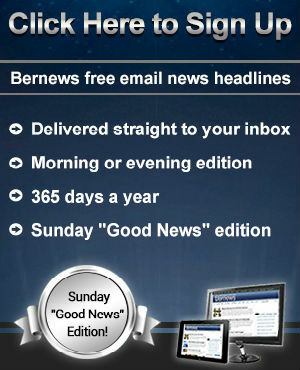 Bermuda Government….rewarding incompetence, one dollar at a time! You do realize that when the OBA was voted in, everyone was asking for them to look into where all the money had gone. So they provide you with the information and yet you’re still complaining and now trying to insult them for doing what was asked of them? I guess some people are just going to be miserable no matter what…..
Man you bean eating to much KFC. Love how you change your name from different servers. Wow! What country are you living in??? I have yet to see one PLP member during that reign to come forward and admit they did a piss poor job controlling the countries finances. They are still in denial! Wow, regardless of the evidence someone had to throw it back…Keep focused or share the special tea so that we can all be paranoid of this government as well. Because if they fail, it will be all independents that get elected next elections. How can anyone support this or not hold anyone accountable. And yet, there are still many who would vote for the plp ******* again tomorrow! How stupid people are. 3 years in government and the OBA is still “only” talking about the PLP. Politics in this island is a horrible. We are heading into 2016 and the OBA with no present or future plan for Bermuda is still pointing blame to what happened in 2010 with the Civil Servants??????? The OBA Won’t hold the Cival Servants accountable but they blame the PLP for everything under the sun. The OBA is a joke. Obvious you only hear what you like, I have heard the OBA talk quite a bit about other things not related to the PLP mess. I have also heard them talk about plans… sure, they haven’t been as flighty and pretty little delusional as the PLP’s Vision, but th have talked about what they are try to do with the heavy burden of realism of what they trying to do it with. But hey, if all you want yo hear is the PLP, you go right ahead, but they haven’t changed, and what they are really about is in the audit right in front of you whether you like it or not. The reason its “still” being talked about is due to the very simple fact that we are all STILL paying for it! Mate… What do you mean putting the blame somewhere else? The numbers and figures speak for themselves… That’s if you even bothered to read the report. Maybe all of this justifies him building a new airport that did not go through a tender process and that most of the public know we don’t need. Billion will go to CCC over the next 30 years. Bob’s way of saying we were all stupid then and we are all stupid now. Except CCC won’t get billions (unless you subscribe to the Burt school of mathematics, which explains why the PLP Vision thinks they can balance a budget by increasing expenditures with no real sense for raising revenues), they got permission for a sole source contracting (the memo supports this… evidently the AG forgot to say his approval was only for the MOU and LA when he wrote that he was releasing them from tendering requirements) and as for justifying that, well that will only be determined based on how thorough the construction contract will be, and given that it is expected to take over a year to write it and get it vetted by several independent parties for approval. Notice how much got sucked out of the Deps of Tourism & Transport? Anyone remember who was Minister for those Deps at the time? Hey Bob, you want to increase your chances of winning the next election? I’d say get on this ASAP and make some heads roll. We don’t want political manoeuvres, we want results. That’s why I voted for you. So why is Minister Richards and the OBA government violating Financial instructions themselves and going against the AG? Why is he always passing the buck to the PLP? OBA is the government and need to act accordingly. They’re not. Try and keep up. Cant wait for the PLP’s response on this one…. There won’t be one. They behave as if they have amnesia! This is not a joke. It is not about the PLP. This is about the civil service being to close to the political parties and not doing their jobs. You should be outraged. Why say anything? Looks like there will be no consequences so just stay low and this too shall pass. There will be no response. 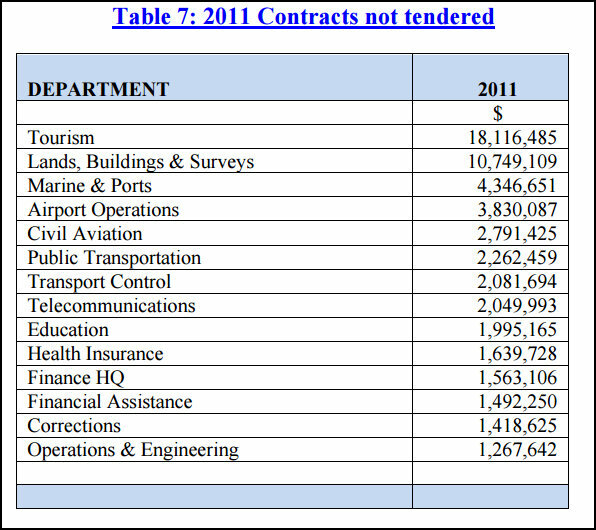 Its obvious that the biggest cost to the taxpayer during the previous government’s tenure were not salaries. Those overspend were up to 1000% in some instances. The rampant overspending cannot be defended. The big question is why are department heads being hammered when they were likely following the instructions of…you guessed it…their respective Ministers. Its blatantly obvious that the PLP tried to do in 14 yrs what the UBP did in 30yrs of government. I hope Bob and company truly put an end to that madness. Neither party will touch the civil service. This was taxpayers’ money. All taxpayers should be outraged to the extent that they stop paying taxes until someone is made accountable. A bit late for that don’t you think? Taxes should have been witheld way back when we were seeing people jetting all over, when it seemed like everyone had a GP car, when they were going crazy with Government credit cards, when these absurd wage levels & benefits were agreed to. That is when the taxpayers should have gone on strike & withheld tax payment wherever they could. A march at least.But where are the band leaders? Well what was the head of the PAC , PUBLIC ACCOUNTS COMMITTEE , DOING during the period mentioned ? Whoever was leading PAC has some answering to do as well ! They obviously didn’t earn their keep . Trying to hold meetings that none of the PLP PAC members would show up to. Also, the Auditor General only just managed to scrape up enough paperwork to complete the qualified audits a week ago. What were they supposed to base a review on? Not to worry, Burt is on it now. The 2014 audit was clean and unqualified. First one in 6 years I believe. Your defense of the indefensible and your deflections are quite amusing. It is amusing because you are constantly attacking the budget cuts being made by the OBA, but then refuse to note the PLP’s role in the need for doing so. the 315 page auditor’s report is a revealing document as to how we got to where we are today. Let me guess it was the global recession’s fault right? You have stated your an accountant several times over on this site. So let me ask you, what would happen to a company CEO and CFO if the firm received one qualified audit, much less 6 consecutive audits? Didn’t Bob head up the PAC during those years. Can we call on the People’s Campaign to pressure the PLP in finding out what went wrong being they are supposed to represent “The People”. Or is the People’s Campaign definitely/only PLP affiliated??? Mr. Preacher Man……I am part of the People…. I need you to do due digilence in investigating this please. How do I get ahold of “The People’s Campaign”. It’s amusing that the PLP are now trying to throw the Civil Sevice under the bus. A Civil Service the PLP largely created….giving jobs to those who they considered friends. Little did those friends know that they would then be the ones who the PLP point the finger at a few years later.